OUR BRIEF WAS SIMPLE: POSITION EQUITIES FIRST HOLDINGS AS LEADERS IN THEIR INDUSTRY WITH AN ENVIRONMENT THAT WAS RESPONSIVE, OPEN AND FORWARD-THINKING. THE RESULT? A FLEXIBLE, OPEN AND INNOVATIVE ENVIRONMENT THAT ENCAPSULATES THE EQUITIES FIRST COMPANY CULTURE AND BRAND VISION. WE DESIGNED A WORKSPACE EXPERIENCE THAT IS EQUAL PARTS ALLURING AND UNDERSTATED; MAXIMIZING THE DRAMATIC HARBOR VIEW AGAINST A NEUTRAL BASE PALETTE OF WARM GREYS, SOFT TIMBERS AND RICH BROWNS. 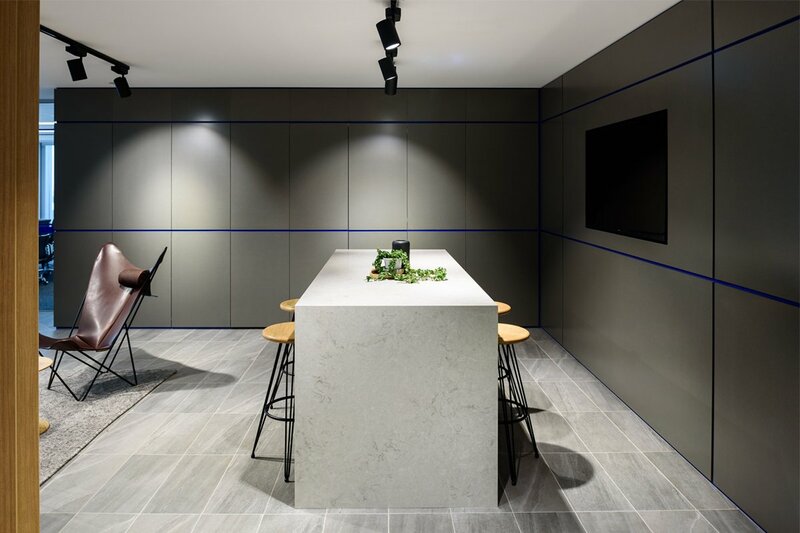 A SLEEK STONE FRONT-OF-HOUSE, A THOUGHTFULLY CONCEALED KITCHEN, DIFFUSED TRANSLUCENT SLIDING SCREENS AND PERFECTLY TIMED INJECTIONS OF CORPORATE COLOUR DEMONSTRATE ROBUST CAPABILITY AND CULTURAL TRANSPARENCY.